Solution To Child Behaviour Problems. The Attitude Box respects your privacy. This document explains our policy relating to your personal data that is provided to us. The Attitude Box is the trading name of The Attitude Company Inc. whose registered office and headquarters are at. P.O. Box 62869 • Houston, TX 77205. 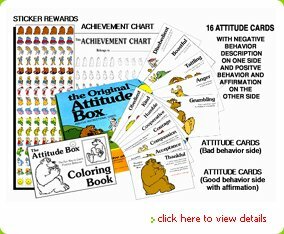 The website is www.attitudebox.com ("the Site"). By using this Site you agree that all personal data that you supply to us will be true, complete and accurate in all respects and you agree to notify us immediately of any changes to that personal data. We will deal with your personal data in compliance with the current US data protection legislation. Please note this applies only to The Attitude Box not to other companies' or organizations' websites to which we link. Personal data will be collected, processed and used by Performance Marketing Resources. Performance Marketing Resources for the purposes of providing The Attitude Box' services and products to you and the other purposes mentioned below. We may use personal data to let you know about products and services that may be of particular interest to you. We will NOT provide your information to third parties that we think may be of interest to you. Because the Internet infrastructure is global, the information you provide may be transferred outside the US Economic Area to countries that do not have similar data protection legislation. By submitting your information you consent to these transfers. The Attitude Box may disclose your personal data acting in good faith if it believes such action is necessary: to conform with a legal requirement or comply with the legal process, protect and defend the rights or property of The Attitude Box, enforce this online agreement, act to protect the interests of its users. When you register for any of The Attitude Box' services, newsletters, mailing lists, competitions or promotions we will require information identifying you so that we can provide the service requested. Our success relies on us producing a product to teach children how to success in life. To help us to ensure we make the very best product we may from time to time analyze the data that we hold and such analysis may be made to find out what is most likely to appeal to individual customers and web-site users. Also, we may provide aggregate statistics about our customers, sales, browser type, operating system, Internet, domain, demographic and profile data, traffic patterns, and related site information to reputable third parties, but these statistics will not include personally identifying information. We hope that this will provide you with a more interesting and fun experience. We may provide your information to our customer service agencies for similar purposes. We or our agents and sub-contractors may occasionally contact you including by post, email or telephone to tell you more about our products and services or to ask you for your feedback and comments on our products and services. Copyrights 2008 The Attitude Box. All rights reserved.